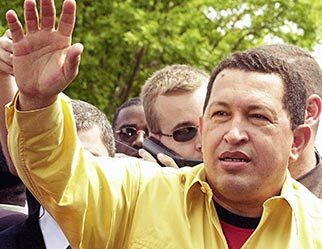 The Communist Party USA expresses deep sorrow at the passing of one of the greatest political leaders of our time, Comrade Hugo Chavez, President of the Bolivarian Republic of Venezuela. We extend our condolences and solidarity to President Chavez’ family, to his comrades and colleagues, and to the people of Venezuela on this sad occasion. In 1998, Hugo Chavez Frias was elected president of Venezuela, which was one of the wealthiest but worst ruled countries in the Western Hemisphere. In his 14 years in power, we applauded the way in which he stood up to Venezuela’s own oligarchs as well as to the U.S. administration as he reshaped the Venezuelan state’s relationship to its own citizens, especially the poorest ones, and to the outside world. In 2002, we reacted with indignation to the cowardly coup attempt and especially to the involvement and participation of the U.S. administration of that time in it. When President Chavez and the Venezuelan people emerged victorious from that reactionary challenge, we celebrated with you. In spite of the calumnies in the corporate controlled press and media, we were delighted with the progress that Venezuela made, under Chavez’ wise and firm leadership, in eliminating poverty and illiteracy, in providing for the health care and housing needs of the Venezuelan people, and in rechanneling the country’s oil wealth away from corporate greed and toward meeting the needs of the people. We were no less enthusiastic about President Chavez’s role in international affairs. His work in creating ALBA) (the Bolivarian Alliance for the Peoples’ of our America), PETROCARIBE and CELAC (Community of Latin American and Caribbean States), as well as his government’s activities to develop MERCOSUR and UNASUR, have had a revolutionary impact in correcting the imbalance of power between the Latin American and Caribbean countries on the one hand, and the United States, Canada and Europe on the other. And there is a potential for expanding that “Bolivarian” dynamic: On March 1, Venezuela and its allies signed twenty seven agreements with African countries, meeting at the Africa-South America Summit, aimed at ending the centuries old looting of African resources by the colonial powers and their successors. Chavez’ letter of encouragement to the ASA Summit was possibly his last statement to struggling humanity to which he gave so much. The blow of losing Chavez is a hard one, for us as for you, but the Bolivarian revolution he started moves on. We pledge our solidarity to the Venezuelan people to make sure it triumphs.